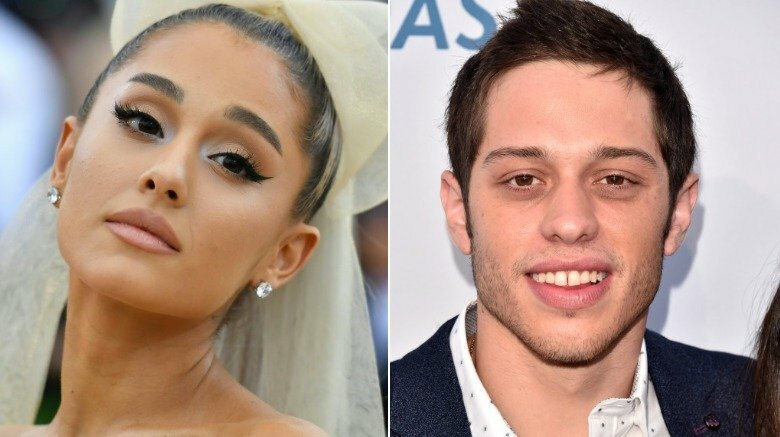 Pete Davidson and Ariana Grande seemed like a pretty odd pairing, but the Saturday Night Live comedian and the pop megastar were hot and heavy after revealing their romance in late May 2018. 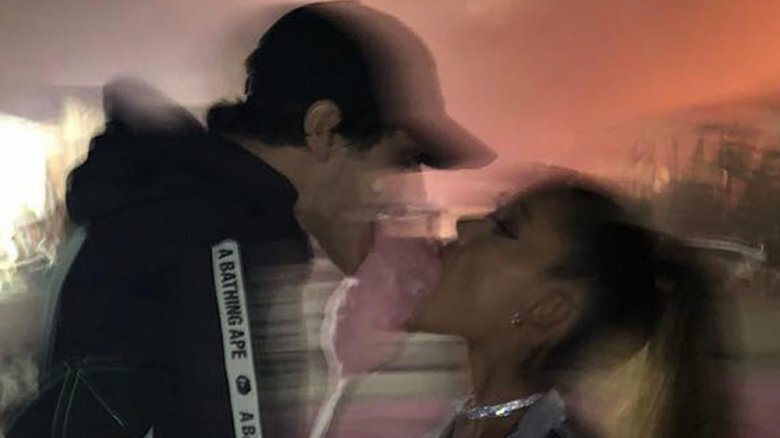 The couple were constantly posting PDA-filled messages on social media, with the self-aware Grande joking at one point that her own Instagram was turning into a Davidson fan account. Just weeks after their relationship went public, sources confirmed to Us Weekly that Grande and Davidson were engaged, calling the couple "a perfect fit." An insider added, "They are both constantly making each other laugh. Their moms have met. They've been very public with their relationship on social media, and they are very in love." Alas, that perfect fit fell apart by October 2018, when the duo called the whole thing off. Forgive us for our skepticism, but we weren't necessarily surprised, considering some of the unusual circumstances surrounding this pair. 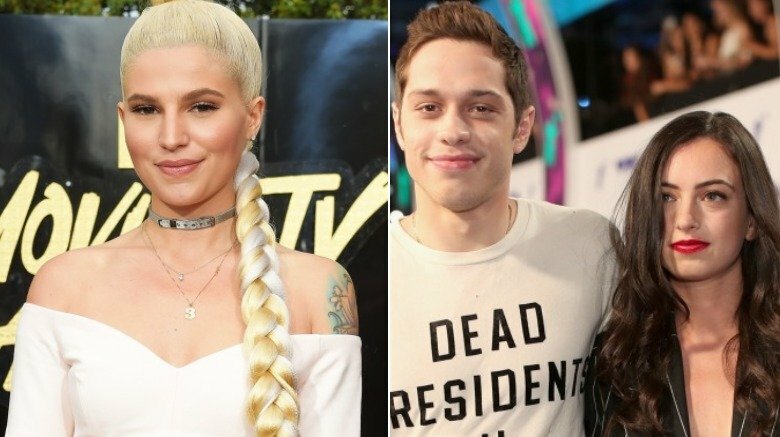 Behold the strangest things about Ariana Grande and Pete Davidson's relationship. 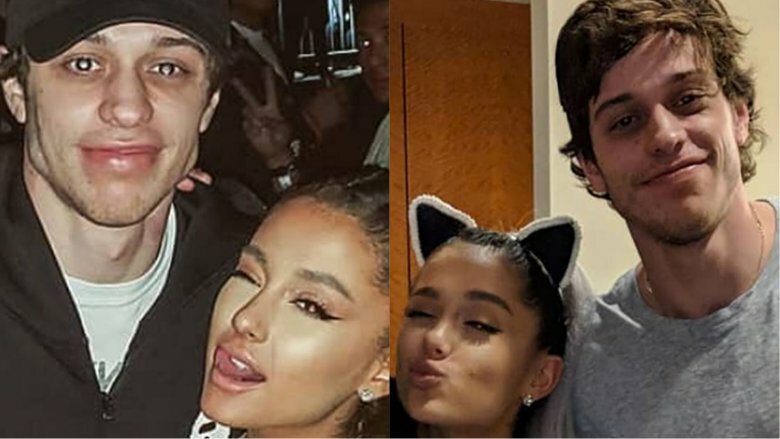 Grande and Davidson were reportedly first spotted getting cozy on May 12, 2018 at a Saturday Night Live after-party, and according to Us Weekly, Davidson's mom joined in on the fun, too. On May 21, 2018, a source told People that Grande and Davidson were casually dating, but by June 9, 2018, Davidson and Grande were supposedly telling pals they were engaged. A source close to Davidson told Entertainment Tonight that the lightning-speed love affair was likely his devise. "In relationships, he is known to be the caring one and the full steam ahead guy," the insider dished. "He is not shy about who he likes … The combination of a girl who is yearning to be loved and mixing it with a guy like Pete creates this intense relationship that is moving a million miles a minute. For both of them, this relationship is heaven compared to their past relationships and they're just clinging to that heaven and thrilled about it." Maybe Grande and Davidson didn't rush in. Perhaps their timeline started much earlier than the world realized … and much earlier than their exes realized, too. According to TMZ, Grande split from the late Mac Miller, her boyfriend of two years, in the first week of May 2018, though a source told People they broke up just after the Coachella Festival a month earlier. Grande tweeted that her relationship with the rapper was "toxic." On May 3, 2018, Davidson's ex, Cazzie David, posted a sweet photo with him on her Instagram account eating cotton candy, which seems to be a pattern of his. And now, for the conspiracy portion: Grande and Davidson were spotted with matching cloud emoji phone cases in May 2018. Combine that with their matching cloud tattoos, and doesn't it make you wonder about the cloud emojis she's been posting since December 2017? Grande has a history of seemingly overlapping her boyfriends. She dated Jai Brooks of the YouTube crew the Janoskians until 2013, when the Daily Mail reported that Brooks accused her of cheating on him with Nathan Sykes. Grande and Sykes dated while promoting their duet, "Almost Is Never Enough." When it flopped, she reunited with Brooks. She and Brooks reportedly also split briefly following her music video for "The Way," her duet with Mac Miller. Hmm. Brooks and Grande called it quits for good in 2014. Grande quickly rebounded with Big Sean. They allegedly hooked up while he was still engaged to Glee star Naya Rivera — so says Rivera in her book. Grande and Big Sean split in April 2015, when she began working on a new album. 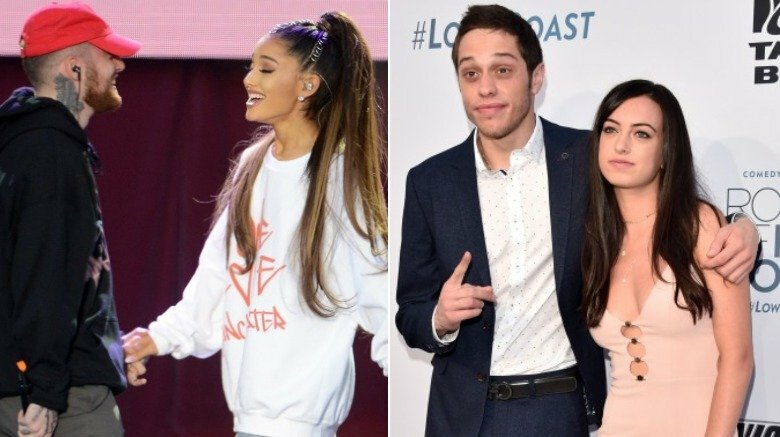 Grande began dating dancer Ricky Alvarez soon after, E! News reported, until the summer of 2016, when she got together with Mac Miller. TMZ reported that Davidson dropped a whopping $93,000 on Grande's engagement ring. Why so expensive? Well, for one, the pear-shaped diamond is massive, and it's VVS1 clarity is unrivaled. Davidson purchased the rock from New York City diamond district jeweler Greg Yuna, who calls himself "Mr. Flawless." People reported that the stone is surrounded by smaller diamonds and all the rocks are set in a diamond and platinum band. 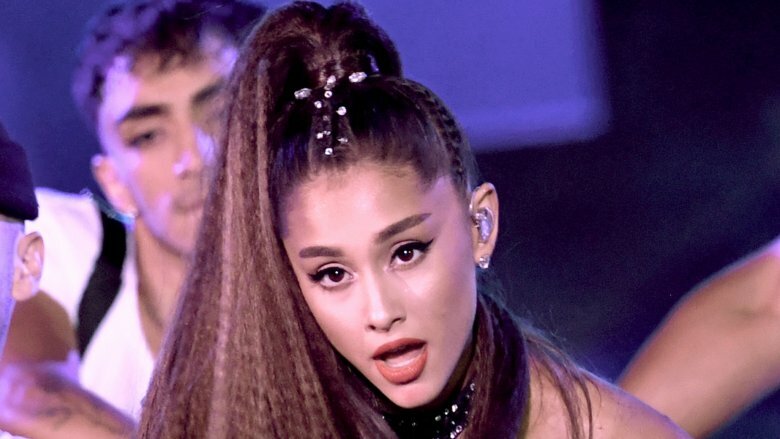 Grande has reportedly been sporting the sparkler publicly since June 2, 2018, when she performed at the iHeart Radio's Wango Tango concert in Los Angeles. Even though Davidson is famous, that's still not a cheap ring. Parade reported that Saturday Night Live cast members are paid up to $24,500 per episode based on seniority, and considering Davidson is still relatively new to the weekend staple — and his appearances are intermittent — that's a big chunk of change for him. Whether or not Grande and Davidson's relationship lasts, at least one part of it is somewhat permanent: They've already got couples' tattoos. 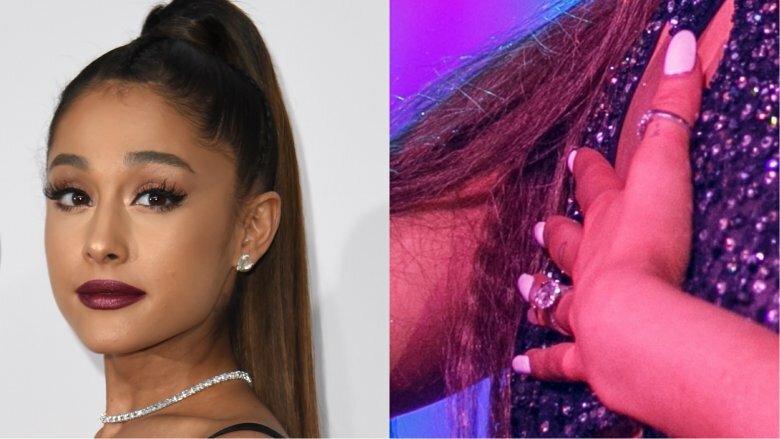 According to Buzzfeed, Davidson inked Grande's signature bunny ear mask from her Dangerous Woman era behind his ear and got her initials, AG, on his finger. Grande and Davidson also sport matching cloud emoji tattoos on their fingers. These aren't Davidson's first seemingly permanent skin etchings for a lady he loves. He had several tattoos celebrating ex Cazzie David that he's reportedly gotten covered up since he moved on with Grande. While couple tattoos are oft considered the kiss of death that dooms most relationships, no matter how in love the parties may be, at least Grande and Davidson's ink will be relatively easy to cover up or laser off. Davidson has been open about his struggles with Borderline Personality Disorder (BPD), which he was diagnosed with in 2017, after several breakdowns and a stint in rehab — he initially thought he was addicted to marijuana. Unfortunately, that struggle may have made his fast-paced relationship with Grande an even bigger target for trolling than other "normal" celebrity romances. 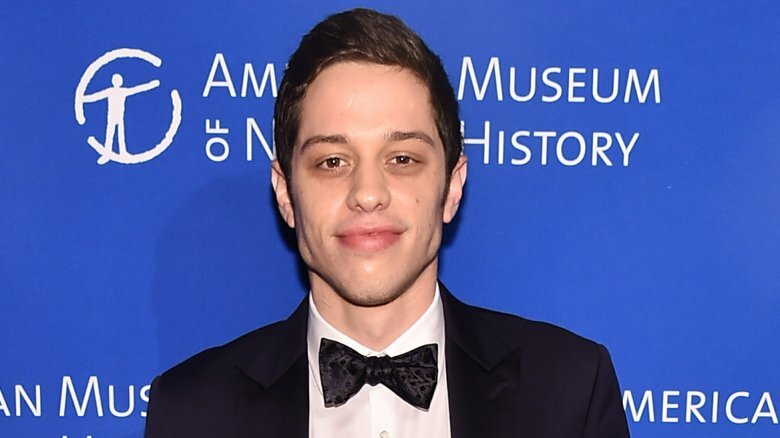 Davidson clapped back at haters in a thoughtful, mature way, explaining in a social media post that, yes, people with mental illnesses can still date, despite the stigmas and prejudices strangers may throw their way. "I [have] been hearing a lot of 'people with bpd can't be in relationships' talk. I just wanna let you know that's not true," he wrote (via People). "Just because someone has a mental illness does not mean they can't be happy and in a relationship … Everybody is different and there are a lot of treatments for mental illnesses and I have done/am doing all of them." Two of Davidson's famous exes have subtly shown their displeasure over the grand Grande romance. Cazzie David (pictured right), from whom Davidson split just before dating Grande (or maybe not even before), posted an Instagram from a safari after news of his relationship went viral. She captioned her snap: "Been in Africa, what did I miss?" On June 11, 2018, the day Davidson and Grande's engagement news was plastered all around the Internet, David posted a selfie winking with red wine, captioning that photo: "Came to wine country a person and leaving a human bottle of wine." Girl Code star Carly Aquilino (pictured left), who dated Davidson in 2015, posted several screenshots to her Instagram stories (via Entertainment Tonight) that seemingly referenced the engagement news. In one exchange, a friend texted her, "I know I'm the 9 billionth person to text you about this but … I can't." Aquilino captioned the screencap: "My day in a text message." Sources told People that Davidson and Grande bonded over their shared traumas. Aside from Davidson's struggles with mental illness, the comedian also suffers from Crohn's disease. His father died in the terrorist attacks on Sept. 11, 2001, so he's been through a lot in his life. Grande suffers from anxiety and post-traumatic stress disorder following the deadly terrorist attack at her Manchester, U.K., concert in 2017. "They've both been through hardships so that's something they definitely have in common," the insider said. "They've both dealt with some dark stuff at a young age." The couple was tested again in September 2018, when Grande's ex, Mac Miller, died of a suspected drug overdose. 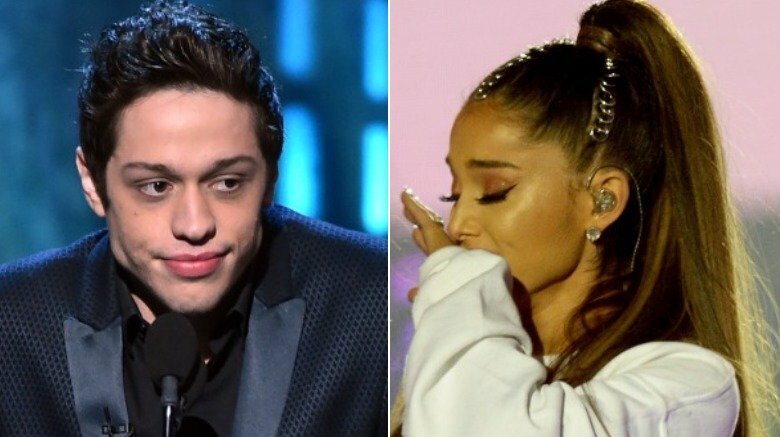 Grande eventually opened up on Instagram about her feelings following Miller's death, saying, in part: "…i can't believe you aren't here anymore. i really can't wrap my head around it. we talked about this. so many times. i'm so mad, i'm so sad i don't know what to do. you were my dearest friend. for so long. above anything else. i'm so sorry i couldn't fix or take your pain away. i really wanted to. the kindest, sweetest soul with demons he never deserved. i hope you're okay now. rest." Rumor has it that Miller's death proved too much for the couple to overcome, and Grande allegedly broke up with Davidson after realizing she wasn't ready to take the plunge.